E-Bridge is proud to have supported the Nordic TSO Cooperation – one of the most advanced cooperation in the energy sector – with a strategy seminar on CEO level. This was an important step to further enable the green transition in the Nordics! E-Bridge has prepared, facilitated and moderated a strategy seminar for the four Nordic TSOs. 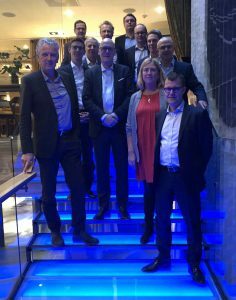 At this seminar the CEOs from Energinet, Fingrid, Statnett and Svenska Kraftnät reviewed the strategic guidelines for an enhanced Nordic cooperation taking into account the accelerating energy transition. Only a strong and efficient Nordic Cooperation can deal with the challenges of an accelerating energy transition. The Nordic CEOs discussed the road to an empowered Nordic Cooperation and defined an approach to manage the changes of the energy system. Furthermore the CEOs agreed to enhance the organisation of the Nordic Cooperation to be able to reach the strategic goals and to further strengthen the stakeholder management.